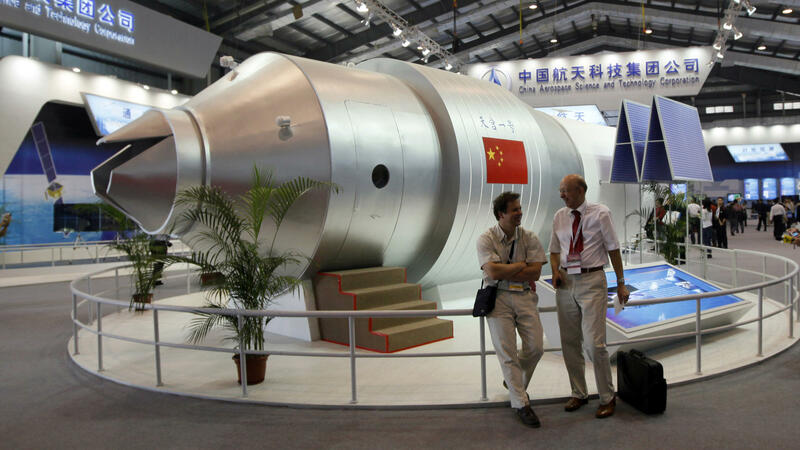 A model of the Tiangong-1 space station at a Chinese airshow in 2010. The real Tiangong-1 will reenter the atmosphere around the end of March. Current predictions say that the 19,000-pound lab should re-enter the earth's atmosphere sometime in the last few days of March or the first few days of April. The lab is called Tiangong-1, which means "heavenly palace." China launched it into space in 2011. The outpost was briefly visited twice by Chinese taikonauts, including Wang Yaping, who beamed down a science lecture to schoolchildren. Although Tiangong-1 has been called a Chinese "space station," it actually is just a precursor to China's planned space station, says Joan Johnson-Freese, a professor at the Naval War College. Since 1992, she says, China has been following a methodical program "to demonstrate human space flight and culminate with a large space station." For that, China's space agency needs to get experience with things like docking and long-term life support in space. Tiangong-1 and another lab in orbit called Tiangong-2, "have been technology test bed laboratories to do experimentation on all those different areas and more," she explains. Now, though, Tiangong-1 is headed back down. And even though space junk this size falls to Earth a few times a year, it's usually something like a spent rocket stage — not a home-away-from-home for space travelers. "These kinds of events are noteworthy and people in this business kind of watch to see what they can learn about how these things come apart as they come down," says Bill Ailor of the Aerospace Corporation's Center for Orbital and Reentry Debris Studies. Most of it, though not all, should burn up during the fiery re-entry. "Somewhere between, say, 2,000 and 8,000 pounds might come down," Ailor says. The possible impact zone covers about two-thirds of the globe, including a lot of the continental United States. But exactly where and when is hard to predict because the vehicle will interact with the atmosphere, which is constantly changing. Still, don't worry about getting hit, says Ailor. "It's just not a very likely event that a particular person would have a problem with it," he says. In 60 years of space exploration, only one person — an American woman named Lottie Williams — is known to have been struck by falling space junk, says Ailor, "and it was just like a piece of fabric material that kind of brushed her on the shoulder." He hopes that someone gets to see the bright streaks created by Tiangong-1 breaking up and burning. "It would be a beautiful thing to watch," says Ailor. But since most of our planet is covered by oceans, he says the most likely scenario is that it will come down over the water and never be seen or heard from again. A prototype space station, put into orbit by China, will soon be falling back to Earth. It is the size of a city bus. No one knows where parts of it will land although regions of the continental U.S. are in the potential crash zone. But as NPR's Nell Greenfieldboyce reports, you have nothing to worry about. NELL GREENFIELDBOYCE, BYLINE: China sent up this orbiting lab in 2011. It's called Tiangong-1. The name means heavenly palace. And it was briefly visited twice by Chinese taikonauts, like Wang Yaping who beamed down a science lecture from space on the side. WANG YAPING: (Through interpreter) Look at these lovely, beautiful, little droplets. Does it remind you of the word translucent? JOAN JOHNSON-FREESE: ...To demonstrate human spaceflight and culminate with a large space station. JOHNSON-FREESE: ...Have been technology test bed laboratories to do experimentation on all those different areas and more. GREENFIELDBOYCE: Now though Tiangong-1 is headed back down. And even though space junk this size falls to Earth a few times a year, it's usually something like a spent rocket stage not a home away from home for astronauts. Bill Ailor is an expert on orbital debris at the Aerospace Corporation. BILL AILOR: These kinds of events are noteworthy. And people in this business kind of watch to see what they can learn about how these things come apart as they come down. GREENFIELDBOYCE: He says most of the 19,000 pound lab should burn up - though not all of it. GREENFIELDBOYCE: ...In a zone that covers about two-thirds of the globe, including a lot of the continental United States. Exactly where and when is hard to know because the vehicle will interact with the atmosphere, which is constantly changing. The fiery re-entry is currently predicted to happen sometime in a window that covers the last few days of March and the first few days of April. Ailor says don't worry about getting hit. AILOR: You know, it's just not a very likely event that any particular person would have a problem with it. GREENFIELDBOYCE: He says in 60 years of space exploration, only one person, an American woman named Lottie Williams, has been struck by falling space junk. AILOR: And it was just like a piece of fabric material that kind of brushed her on the shoulder. GREENFIELDBOYCE: He says hopefully someone will get to see the bright streaks created by Tiangong-1 breaking up and burning. AILOR: It would be a beautiful thing to watch. GREENFIELDBOYCE: But since most of our planet is covered by oceans, he says the most likely scenario is that it will come down over the water and never be seen or heard from again. Nell Greenfieldboyce, NPR News. (SOUNDBITE OF FRITZ VON RUNTE'S "SPACE ODDITY") Transcript provided by NPR, Copyright NPR.